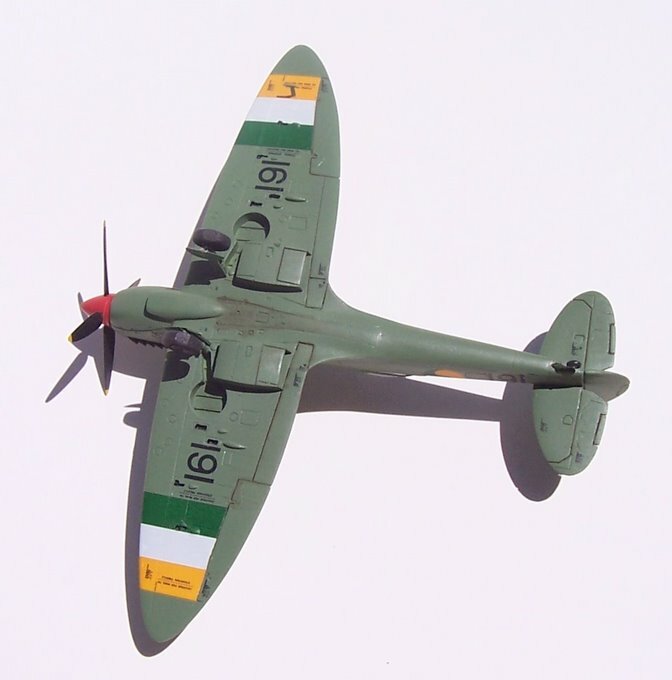 A training version of the Spitfire was first proposed in 1941, but existing trainers were deemed adequate, plus it was considered undesirable to interrupt production of frontline single-seat fighters. Shortly after the end of WW2 the idea was revived by Vickers and a Mk VIII airframe was converted as a trainer demonstrator. Movement into the jet age precluded serious RAF interest. The first three trainers were ordered by the Netherlands in 1948 and, like all TR 9’s to follow, these were based on the Mk IX airframe. Ten TR 9,s were bought by India, one by Egypt and six by The Irish Republic. Interest from Argentina, Iraq and even the Soviet Union ultimately lapsed without orders being fulfilled. Several single seat Spitfire warbirds have been converted to tandem seating configuration, although some have the Grace-Melton canopy a bit like Sea Fury T.20 canopy rather than the separate canopies featured in the kit. 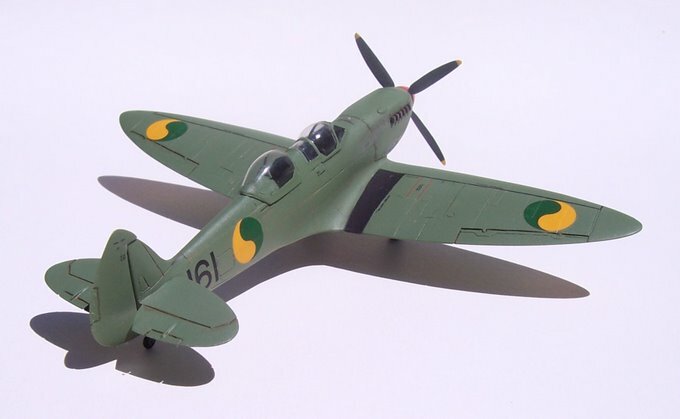 I have built several of CMR’s Spitfire kits, including the hi-tech kits with coloured Photo-Etch (PE) and canopy masks (these cover Mks VII, VIII, IX & XVI). The latest in this group, the TR 9, fills an important gap because until now somewhat less comprehensive kits or conversions have been all that was available in 1/72 scale. CMR have captured many of the important subtleties of the TR 9. Obviously there’s the front cockpit moved forward towards the firewall (13.5” on the real aircraft), and the new rear cockpit. 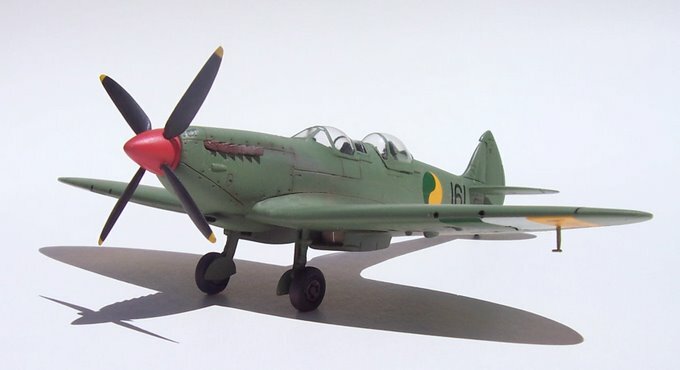 But also CMR have correctly duplicated the distinctly different front cockpit layout and construction, with its horizontal reinforcement just below the level of the access door, different throttle and prop controls and so on. A similar level of attention has been paid to the layout of the rear cockpit. Both pits feature the different shoulder belt inertia tensioning system to that of the single-seater. This used rollers in the head rests, and a vertical belt going down to a spool in below the floor rather than a cable running horizontally towards a rear fuselage anchor-point. Other changes reflect the lack of cannon bays and additional wing fuel tankage to replace that lost when the cockpit was moved forward. The kit has comprehensive coloured PE interior details, plus the option of PE or resin external details like wheel hubs, torque links etc, The Eduard canopy and wheel masks are a real bonus too. You also get optional exhaust types, Coffman Starter bulge, wheels, gun-sight, seat armour, and two types of training rockets. The package is rounded out with numerous markings options covering the Irish Air Corps, Royal Netherlands Air Force, Indian Air Force and an attractive orange civilian machine. The kit builds in the usual hassle-free way for a CMR Spitfire; although I must admit aligning the fuselage took a little more care due to the two cockpit openings and their contents compared to single-seaters. As I have found with this family of high-tech kits, it pays to either deepen a groove where the nickel-plated PE radiator/Intercooler matrices are fitted into their underwing houses, or trim the PE part by about 0.5mm for a perfect fit. I like to mask these inserts before I glue them in place, then I can spray the underside colour inside the radiator housing. Once dry the masking is picked out from front and rear and a drop of black oil wash placed on the PE detail leaving nice-looking radiator cores. I enjoyed this straightforward build, and as always appreciated the fact CMR provides two vac-form canopies just in case. CMR’s decals were good to use and very nicely printed. I made one mistake and that was to decal in the lounge one evening instead of in my better lit modelling room. As a result I missed a little bit of silvering caused by my moving some of the stencil decals around too much. These were from Tally Ho’s Mk IX stencil sheet. The green I used was Humbrol 78 and in reality looks a bit lighter than in my photos, but I’m not much of a photo editor so I failed to correct this in the images. 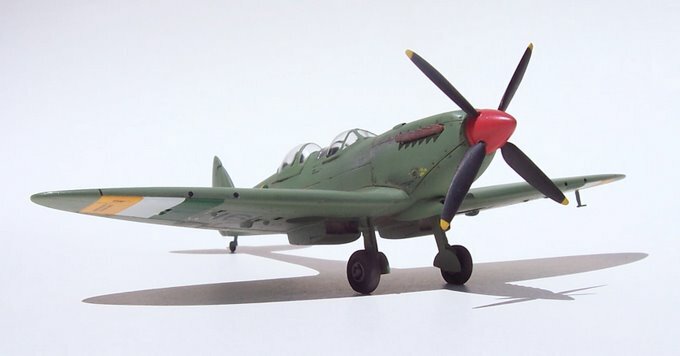 It’s great that the definitive Spitfire TR 9 in 1/72, if not all scales, has finally arrived.